I've got some business cards! I've been to several events of various natures now (like the Hardware Meetup), and at each one I've found that a 'business card' or two would be really handy to give to people so that they can remember the address of this website. 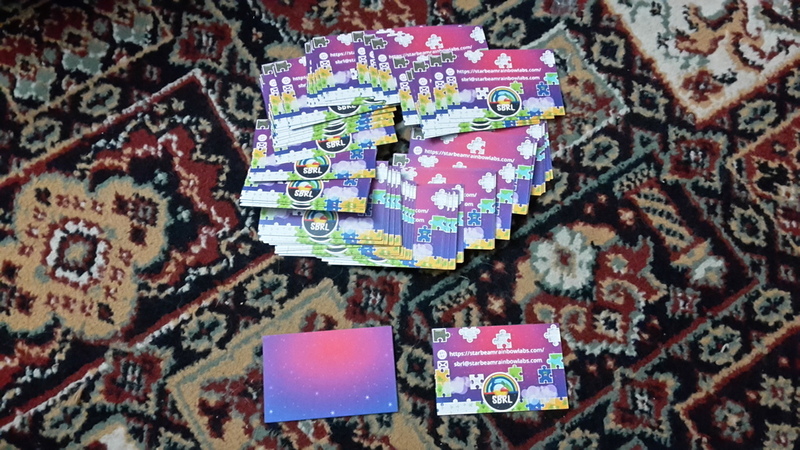 I'm finding that it's a rather good idea to promote and build your brand at these kind of events by showing people the cool things that you've created and learnt, and business cards seem to be just the thing that helps you do it. If you're in the Hull area and interested in hardware, you should seriously consider coming along. There's a page on meetup.com that contains the details of the next meetup, but the general rule of thumb is that it happens at C4DI every first and third Thursday of every month at 6pm - 8pm. 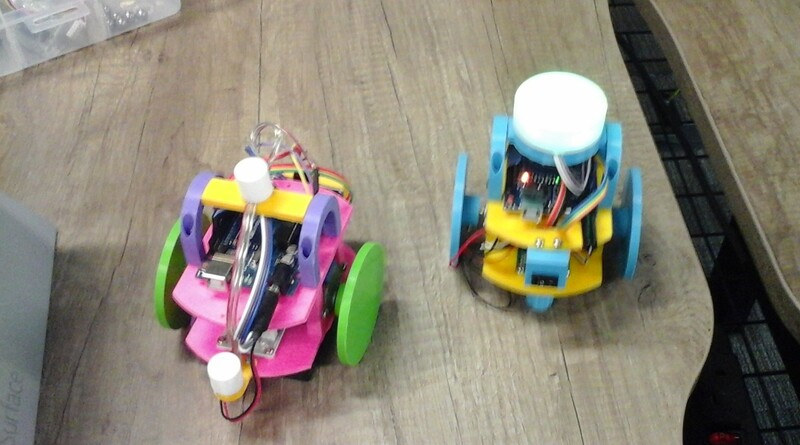 It's one of Rob Miles' Hull Pixel Bots, with a Wemos D1 R2 on the top and two stepper motors and their driver boards mounted in the middle, and a battery box on the bottom. Today Rob Miles was kind enough to give me a lift to the monthly hardware (or hull pixel bot) meetup. It was different to what I'm used to, but it was rather fun actually! 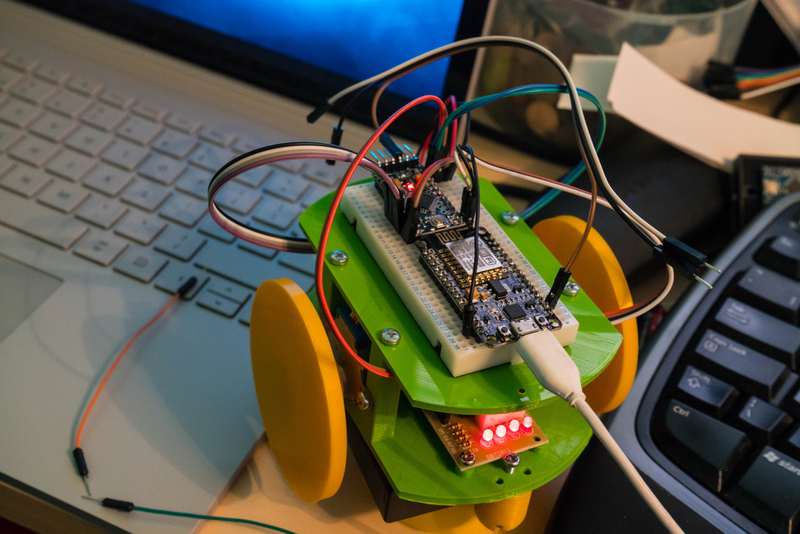 Rob Miles has built a kit that gives you the parts to build your very own Arduino-powered robot that trundles around on the floor. He's also managed to add a WiFi chip to it too - so you can (provided you write the code) connect to your pixel bot and control it remotely! You can build your own by going to hullpixelbot.com. I'll certainly be playing around with it and attending the next meetup (meetups are on the first Thursday of every month at 6:00pm at C4DI). Attending the Game Development conference for students at Hull University gave me a little bit more of an idea as to what companies are looking for in perspective graduates (and more importantly interns in my case) that they are thinking of hiring. The thing that came across to me as the most important is the idea of an up to date portfolio. If you haven't come across one of these before, a portfolio is basically a showcase of everything that you've done, presented in a manner that is pleasing to the eye. In my case my portfolio is my website, so I've just been spending half an hour or so updating it to reflect my current projects and accounts (I've opened an account on Codepen). You should do this too, and if you haven't got a portfolio set up, you can create one for free with Github Pages. If you're feeling particularly adventurous, you could also create a blog using Jekyll - Github pages supports this too, and it lets you create blog posts as markdown documents (like I do for this blog, although I wrote my blog engine myself), and it automatically transforms them into a blog post on your website for you. You can even use the Github web interface to do everything here! If you comment below or get in touch with me in some other manner, I might feature a selection here on this blog. Before I get into today's post, I wanted to include a picture of some firework that I managed to photograph a few days ago on my phone. 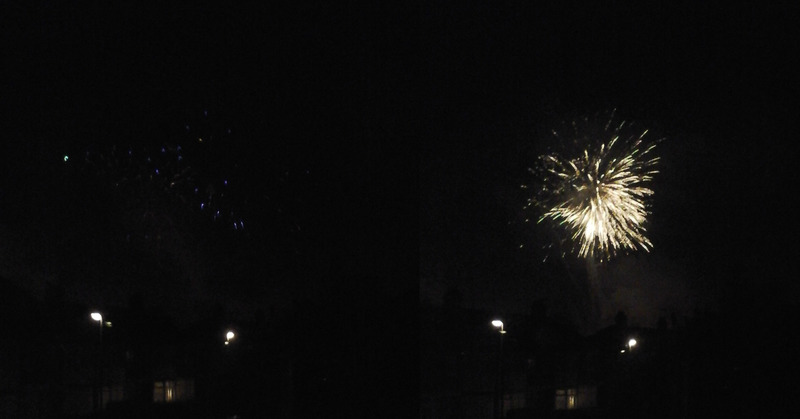 A heard them outside and when I took a look out of the window, this is what I saw! read(Input), (Input = end ; loopa). The above is a simple rule that keeps asking for user input until the user enters 'end'. This is done through the semi colon, which acts as an or operator. Although this works, it isn't very readable. Let's try something else. Much better. The above is divided up into the stopping condition (i.e. when the user types end), the main loop, and a rule that kicks the rest of the program off. When go is called, we call loopb with something as a parameter immediately. Since this doesn't match the fact loob(end), Prolog looks at the rule we defined, loopb(Input). Then it asks the user for input, and starts the process over again until the user inputs end. Factorial is N * Ans. That concludes this post on the 6th Prolog lab session. If you don't understand something (or I've made a mistake!) please post a comment below and I'll do my best to help you. Also, if you have any, post your firework pictures below. I'd be interested to see them! Built by Starbeamrainbowlabs. 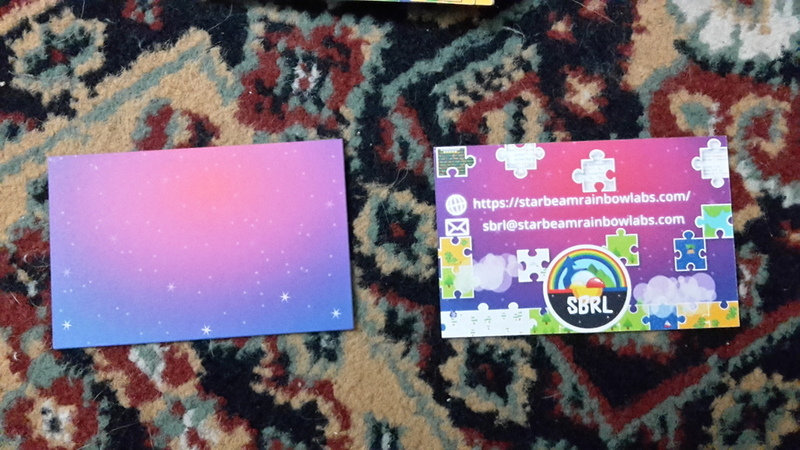 Feedback can be sent to feedback at starbeamrainbowlabs dot com. Comments can be made on all blog posts. Some icons from the awesome Open Iconic icon set. Design © Mythdael 2019. More information available on the licensing page.